I first want to preface this with… this is a ‘honey do’ :). In general, I see most designs of Balustrade tables have a top with breadboard ends and the bottom with bottom panel that have boards running perpendicular to the boards on the top and they have no breadboard. Doesn’t this go against proper use of grain direction? I am getting ready to build mine, but am struggling with that detail. Does any one have thoughts on this design? 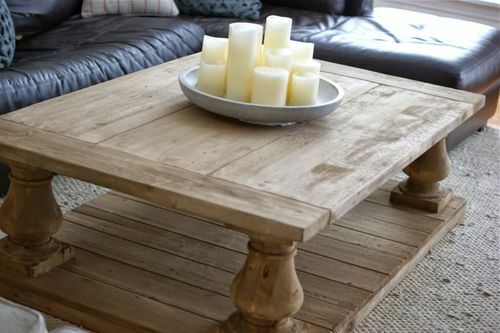 I was thinking of doing breadboards on both top and bottom, but am not sure if there is some sort of design standard behind this particular design of coffee table. Actually if you look at the one all of the “copy cat” sites try to knock-off, you can see that they use that. The general rule though IMO is when doing a “honey’do” list its usually best to do what honey wants. IMO breadboard ends would look really odd on the bottom, I actually personally don’t care for the look of this bottom either. What I did on the last one I built is put an “apron” around the bottom flat of the legs, with a cleat that the planks can rest on. IMO it looks more aesthetic than this bottom-heavy design. YMMV. Yeah, the wife is definitely the most important piece, but she doesn’t sweat details like this and I’d rather build something that is more technically sound and will last as long as possible (not that I think this other design is going to fall apart). But when I see these tables, I first think… ‘why did they do that?’ and when someone looks at what I’ve done… I wouldn’t be happy if someone thought that. I like your thoughts about the apron, do you have any pictures you’d be willing to share? I personally like the breadboards, a traditional breadboard probably shouldn’t be used since the balustrade is under it. I think they (the balustrades) need to be inset in a way that they are not under the breadboard ends… ugh. I am making a simple project much too complicated. Maybe I’ll just cave and do a copycat. If I am observing correctly, your question may be moot. The bottom surface appears to be made up of individual “slats” that are not connected (edge glued). As such, any expansion/contraction will be taken up by the spaces between them and will have no effect on the top or legs. If the “slats” are edge glued there will be some expansion/contraction issues that could be dealt with by allowing some slippage in the leg fasteners. Of more concern is the supporting “battens” under the slats whose grain is opposite to the slats. If the slats are edge glued and then glued to the “battens”, this will cause serious problems. I agree, I was thinking that might be the case. Thanks for your advice. I may just forego the breadboards altogether and use wider boards above and below the balustrades that is at least the width of those. One feature of the example in the photo that is “bad” design, IMO, is that the bottom panel is the same size as the top. This tends to make the bottom panel look bigger than the top. I would consider making the bottom panel slightly smaller than the to, maybe do a mock up to get the proportions correct.